Welcome to the Regis School of Music! The Regis School of Music was founded in 1996 with the aim of promoting classical music on all levels. The RSM is a registered charity and is now in its 21st season. We have many exciting events and performances planned for the year ahead! The school offers ﻿musical tuition﻿ and stages regular performances by established professional musicians from around the world. As well as providing a dedicated venue for rehearsals and performances by local musicians and music groups, the Regis School of Music is actively involved in organising and supporting music festivals and competitions. At present the school provides individual music lessons to over 70 junior and adult students on piano, violin, flute, recorder, saxophone, clarinet, voice and classical guitar. 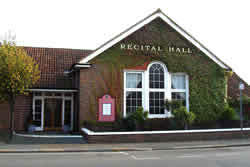 It runs a pre-school curriculum for 0-5 year olds and their carers, plus several ensembles for adults, hosts regular series of Sunday Afternoon Recitals, supports three music festivals including its own Summer Festival in June, and is home to the West Sussex Guitar Club with a programme of club evenings and professional recital series' given by world celebrated musicians. The Regis School of Music is an official centre for music examinations held once a term by each of the Examining Boards: The Associated Board of Royal School of Music & Trinity.